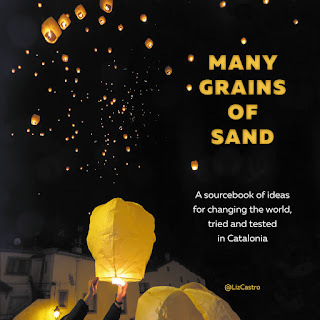 On September 12, 2016, Liz Castro presented her new book, Many Grains of Sand at the Institut d'Estudis Catalans, thanks to Institut director Joandomènec Ros, journalist Arturo Puente, and the President of the Parliament, Carme Forcadell. The book is a collection of 537 photographs taken by more than 170 photographers, illustrating the creative, non-violent, democratic initiatives used by Catalans to with their independence from Spain. It is available in both soft and hardcovers, and in Catalan or in English. Lluís Brunet, who collaborated with many photographs in the book, did a photo essay of the presentation.